Paul Cook branded recruitment in English football a ‘disgrace’ as he bolstered his scouting team. Cook has added former Dagenham & Redbridge boss, Wayne Burnett, to his staff as he sets about putting in a framework to unearth talent. I think recruitment in the English game is as bad as it gets. I think it’s a disgrace, in general. 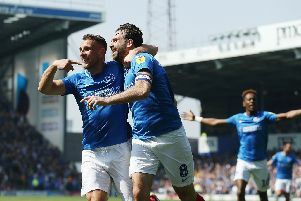 But the Blues boss admitted Pompey’s recruitment system is a long distance from where he feels it needs to be. Cook has delivered a passionate assessment of the faults he sees among domestic clubs when it comes to finding players. The 48-year-old feels few teams are actually finding the rough diamonds to round into gems. And that has led to his damning assessment of the work being carried out in the game. Cook said: ‘People speak about recruitment in football, but I think recruitment in the English game is as bad as it gets. I think it’s a disgrace, in general. ‘If you look at the top clubs and how many players they buy, look at how many young players are in their senior squads or how many they have out on loan. ‘Then look at our level and the amount of players that are turned over on a regular basis. ‘There’s so much made of recruitment in football. ‘When you look at it, what club has done well? ‘You’d look at Plymouth, but with respect, Derek has recruited from Scotland. ‘You recruit from what you know. ‘I don’t think any team does well. ‘Recruitment’s when you look at a player and think “oooh, he’s done well”. ‘When you have a younger player like Ben Tollitt for example, who doesn’t have any stature. ‘It’s easy to sign the majority of players we sign. You don’t need scouting systems for that. Cook has now turned to Burnett to help expand his scouting network at Pompey. Burnett, who left Dagenham last month after two years, will have a remit to find players across the south of England. Cook is comfortable he has contacts across the north of the country to find players. He feels Burnett’s experience will proved useful, and highlighted the significance of bringing in someone with a similar footballing philosophy to the one he has. Cook said: ‘Wayne’s on board with us now and doing a little bit of scouting down south for us. ‘He’s a great lad with a great knowledge of the game. ‘He wants the game to be played in a similar way to us. ‘So his eye for a player will be good. ‘It’s more for us to give a little bit of help to Wayne while he waits to get back into the game than anything else. ‘We’ll see it where it goes. ‘We’re just in the initial stages of our scouting and recruitment. ‘I think it’s something you look at seriously. How can we at Portsmouth make it better? ‘We put things in place but we are still working towards where we need to be?